We are getting closer to prom which means it's time to start shopping for a dress! 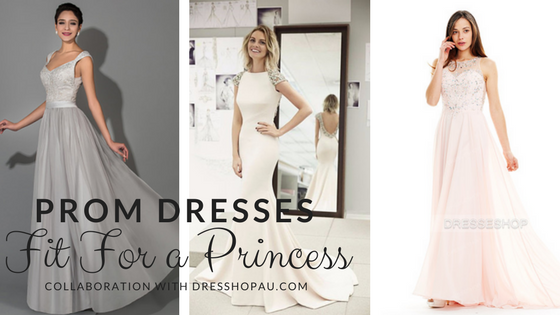 DRESSHOPAU has some really pretty dresses that are perfect for prom and will leave you looking like a princess! They have a variety of dresses at wonderful prices and they are all so unique so you won't be dressed the same as any of the other girls at prom. All photos are from the DRESSHOPAU.com website and were used with permission. This is a payed sponsorship but all opinions are honest and my own. I'm all about finding a unique dress for prom even if it isn't an actual prom dress. The last thing I want is to look like everyone else on prom night. This dress is actually featured as an A-line mother of the bride dress but I think it's gorgeous! I definitely feel like it's the perfect dress if you want to feel like a princess and it comes in 31 colors! My personal favorite colors for the dress are the silver shown or the blushing pink. This ivory dress is stunning! I love the beaded sleeves and that the beading goes down the back of the dress. I love that it's fitted but not tight and the sweep train in the back is a fun touch. Featured under sweetheart wedding dresses, this gorgeous dress is definitely fit for a princess. This dress comes in three color but my favorite is the ivory shown in the picture. I know there are different opinions on whether or not you should wear a short dress to prom but I think short dresses are perfectly fine for prom and I'm actually looking at a short dress for prom this year! This short lace dress screams "I'm a princess!" from the gorgeous blush color shown in the picture to the elegant lace. This dress is perfect if you don't want to show a lot of skin, it hits right above the knee, has 3/4 length sleeves which they call "princess half sleeves" on the website (told you this dress was for a princess), and the back is completely covered. The dress comes in 33 colors and I like the blush (shown in the picture), the dark navy, and the dark green. This dress is featured under midi bridesmaid dresses. If you haven't noticed, I really love the pinks for prom. This pearl pink chiffon prom dress has gorgeous beading down the front and back and below the button on the back is a slit. This dress comes in 32 colors and is featured under prom dresses. The pearl pink shown is my favorite color for the dress. I hope this post will help you find the perfect dress for prom! All photos are from the DRESSHOPAU.com website and were used with permission. This is a payed sponsorship but all opinions are my own.